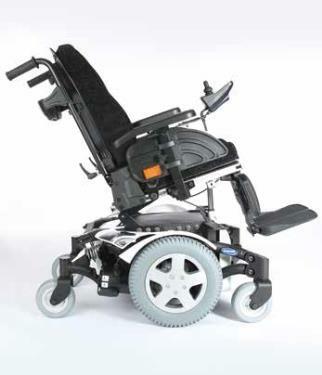 TDX SP 2 NB Powerchair high performance driving base. Patented Sure Step suspension enables negotiation of obstacles and thresholds whilst maintaining a level seat. The addition of the Stability Lock ensures uneven terrain causes no problems to ride comfort or driving control. A turning circle diameter of 112cm ensures the TDX SP2 NB is perfect for restricted and busy indoor environments.A true centre wheel drive that can turn on its own axis. To compliment the compact dimensions, excellent manoeuvrability and impressive stability over uneven ground the TDX SP2 NB features the Dynamic Controls DX2 control system as standard. From drive only to high end specialist controls DX2 sets a high standard in drive performance. TDX Range Now with 3 year Warranty! We are pleased to announce due to a proven track record in quality, and sustained robustness in design, the frames for the TDX centre-wheel drive range now offer a 3 year warranty! This applies to both the compact TDX SP Narrow Base chair and TDX SP2 Heavy Duty version, which has a maximum user weight of 180kg (28 stone)! Both the TDX and the new TDX2 ranges are covered by this extended warranty, offering our customers further confidence in the Invacare portfolio.